Here’s a syndicated public service show that I think is new to the blog. 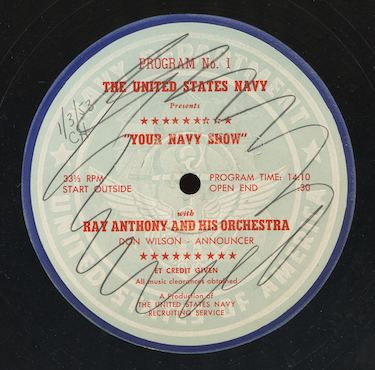 “Your Navy Show” featuring Ray Anthony and His Orchestra with announcer Don Wilson on a break from the “Jack Benny Show”. There’s some nice hi-fi sound on the show as Ray Anthony kicks off the proceedings with “I Get a Kick Out of You”. The program also features vocals from Tommy Mercer and the Skyliners. The show was digitized direct from an original 16” vinyl Navy Reserve transcription.